A new wave of shoppers including millennials is affecting how retailers manage their products from curation and marketing to sales. Along with the propensity to rely on smartphones, apps, and other digital technology, this new generation is also shopping online more for their weekly groceries. In response to this trend, traditional grocers are seeing fresh opportunities to appeal to this new wave of shoppers. How are brick-and-mortar grocery stores enhancing the shopping experience? Cost and convenience continue to appeal most to millennial in-store shoppers. Logically, these two factors are ideal areas for brick-and-mortar stores to improve. Many have already began experimenting with strategies like offering delivery and in-store pickup, developing private label products, curating special products, and featuring fresh, organic produce. The new look and feel of brick-and-mortar stores will offer customers some sweet deals and features while spicing up their products and customer service. Today’s fast-paced world calls for convenience in managing household and personal tasks, and brick-and-mortar stores can respond by experimenting with local delivery/ship-from-store services or developing an in-store pickup strategy. 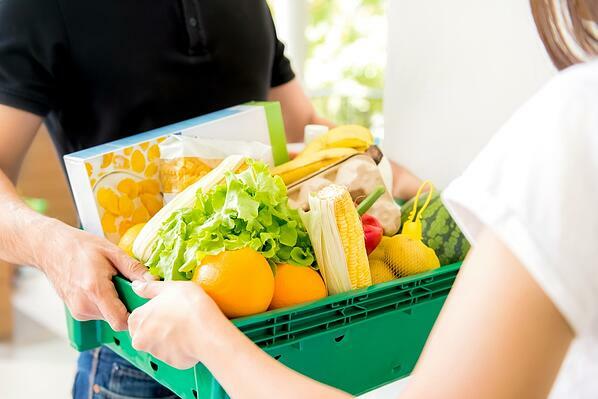 These strategies offer customers faster delivery times than a traditional online grocer and quality fresh food often from local growers, which is also a value-added consideration for millennials. According to JLL, 45% of internet customers for brick-and-mortar retailers utilize in-store fulfilment, making the role of the store essential to a retailer’s distribution strategy. Leveraging resources with delivery services like Postmates and Instacart can assist stores with the technology and implementation of same-day delivery. Logistical solutions like these help to interest millennial shoppers looking for flexibility and convenience. Instacart has teamed up with Target and others, paving the way for replication of this business model. More and more, private label products are filling shelves and becoming a preferred choice among the newest generation of shoppers. FONA International reports that store brands comprise at least 50% of items purchased by more than 50% of consumers, and 71% of consumers attest to the improvement of private label brands over the last few decades. Once referred to more commonly as “generic,” private label products accounted for $80 million in sales in 2015, with an expectation to reach $84.7 billion by 2020 as further indicated by FONA International. Globally, the trend supporting private label products echoes similar statistics. Euromonitor International reports that 89% of respondents worldwide bought private label products in 2013. Brands such as Sam's Choice and Great Value (Walmart), Simply Balanced and Archer Farms (Target), and LiveGfree and Clancy's (Aldi) are among the thousands of examples of successful private label products. Trader Joe’s self-named products and Whole Foods’ 365 brand are also well-known, high-value private label products. Key elements of this business strategy include commoditized categories such as butter, cups and plates, ice cream, frozen seafood and meat; multi-layered approach to brand positioning and assortment; and strength of retailer relationship. In addition, traditional marketing tools can be leveraged to alert consumers to the quality, cost-savings, and other benefits of a grocer’s private-label products. As shopping becomes more of a responsive experience, brick-and-mortar stores are taking note on how to meet and exceed customers’ needs through product curation. Rather than filling stores with thousands of products that move off the shelf slowly if at all, stores are filling shelves with products curated specifically for the local shopper based on past purchases and other data. Chad Arnold, president and CEO of the online grocery service Door to Door Organics, remarks, “Companies are now scaling back stores and getting them more focused to specific customers, instead of a one-store-fits-all approach." Wal-Mart, Target, and Kroger are among companies that are choosing to scale back some of their stores to accommodate a more tailored product inventory. While stores like Whole Foods Market and Trader Joe’s have been reaping the benefits of offering fresh and organic produce to their local markets, the success of German grocers Aldi and Lidl also speaks to this trend. Aldi recently added another $1.6 billion to its $3 billion for U.S. expansion, which is reported to include more than 1,300 stores by 2020, and 2,000 by the end of next year. Another German discounter, Lidl, also plans to invade the U.S. market soon with plans to open 100 stores across the east coast by 2018. Seventy-five percent of consumers say the produce department is the most important, followed by fresh meat, poultry, and seafood (60%); store brand products (36%); local farm foods/produce (35%); and the in-store bakery (29%), according to a new survey by Packaged Facts, a leading publisher of market research in the food, beverage, consumer packaged goods, and demographic sectors. Brick-and-mortar stores that are responding effectively to these facts can position themselves for a new era of in-store shopping experiences — one that yields dollars and sense.